In the present study, a new type of mass spectrometer combining a quadrupole mass filter, a higher collision dissociation (HCD) cell and an Orbitrap detector, was evaluated for the analysis of dried blood spots (DBS) in doping controls. DBS analysis is characterized by the necessity to detect prohibited compounds in sub-nanogram-per-milliliter levels with high identification capacity. After extraction of DBS with an organic solvent and liquid chromatographic separation (using a regular C18-RP-analytical UHPLC-column) of target analytes, mass spectrometry is performed with a high-resolution full scan in positive and negative mode by means of electrospray ionisation. Single-product ion mass spectra are acquired using the data-dependent analysis mode (employing an inclusion list) for previously selected precursors of known prohibited compounds with fixed retention time ranges. Besides, a sensitive screening in a targeted approach, non-targeted analysis for retrospective data evaluation is thus possible. The chosen experimental design enables the determination of various drugs from different classes with one generic sample preparation which is shown for 26 selected model compounds (Δ9-tetrahydrocannabinol (THC), tetrahydrocannabinol-9-carboxylic acid (THC-COOH), methylhexaneamine, methylphenidate, cocaine, nikethamide, 3,4-methylenedioxyamphetamine, N-methyl-3,4-methylenedioxyamphetamine, strychnine, mesocarb, salbutamol, formoterol, clenbuterol, metandienone, stanozolol, bisoprolol, propranolol, metoprolol, anastrazole, clomiphene, exemestane, dexamethasone, budesonide, selective androgen receptor modulator (SARM) S4 (andarine), SARM S1, hydrochlorothiazide). Generally, only qualitative result interpretation was focussed upon, but for target analytes with deuterium-labelled internal standards (salbutamol, clenbuterol, cocaine, dexamethasone, THC-COOH and THC) quantitative analysis was also possible. Especially the most challenging analytes, THC and its carboxy metabolite, were detected in DBS at relevant concentrations (<0.5 ng/mL) using targeted HCD experiments. The method was validated for the parameters: specificity, linearity (0–20 ng/mL), precision (<25%), recovery (mean 60%), limit of detection/quantification, ion suppression, stability and accuracy (80–120%). Six isotope-labelled analogues used as internal standards facilitate a quantitative result interpretation which is of utmost importance especially for in-competition drug sports testing. 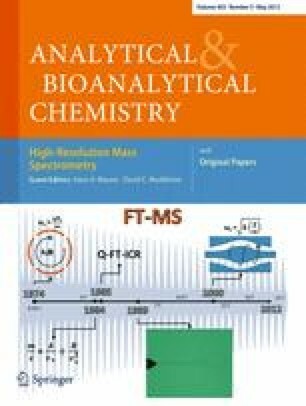 Published in the special issue High-Resolution Mass Spectrometry with guest editors Hans H. Maurer and David C. Muddiman. The study was carried out with support of Antidoping Switzerland (Berne, Switzerland), the Manfred Donike Institute for Doping Analysis, Cologne, and the Federal Ministry of the Interior of the Federal Republic of Germany.